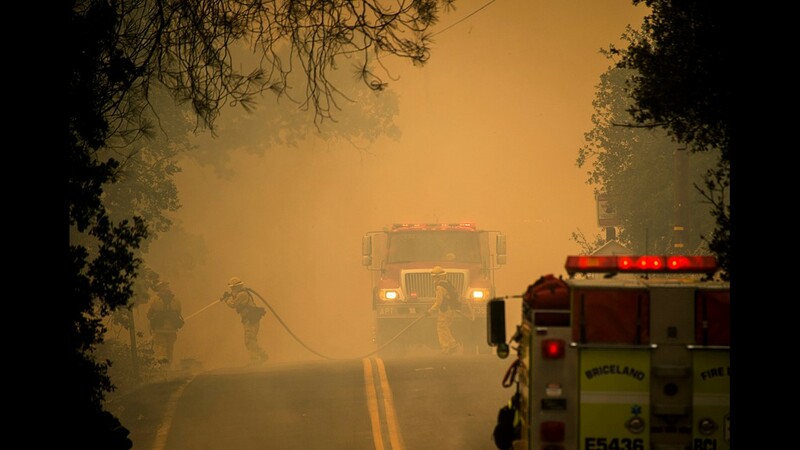 Firefighters try to contain flames from the River fire after strong winds caused it to threaten the town of Lakeport, Calif., on Aug/ 3, 2018. The Mendocino Complex wildfire exploded overnight to become the second-largest blaze in California history, at about 425 square miles. That's larger than 18 Manhattan Islands and roughly one-third the size of the state of Rhode Island. 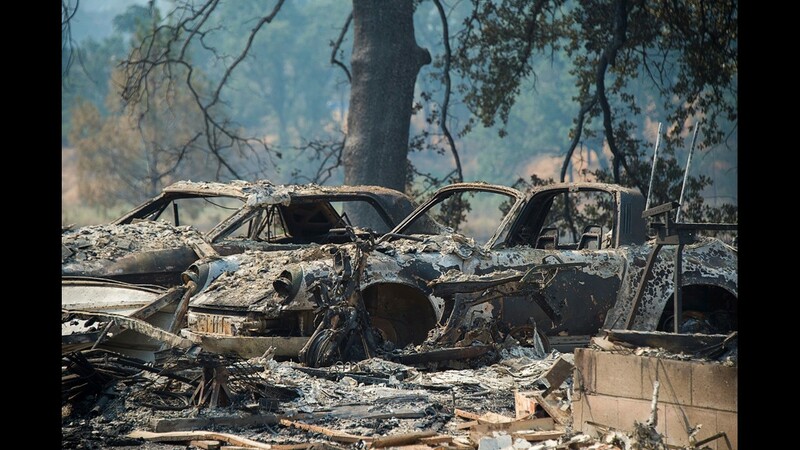 The fire has destroyed about 140 structures and threatens thousands more, according to the California Department of Forestry and Fire Protection (Cal Fire). It's only 30 percent contained. 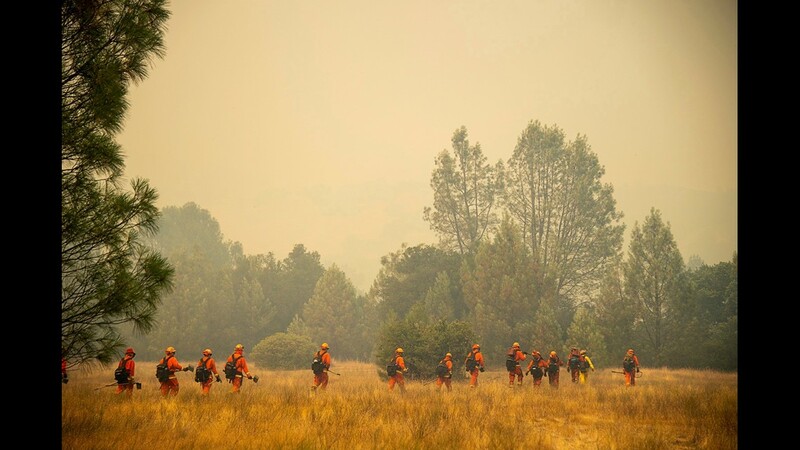 The fire is on pace to become the largest in state history. It's behind 2017's Thomas Fire by only a few thousand acres. 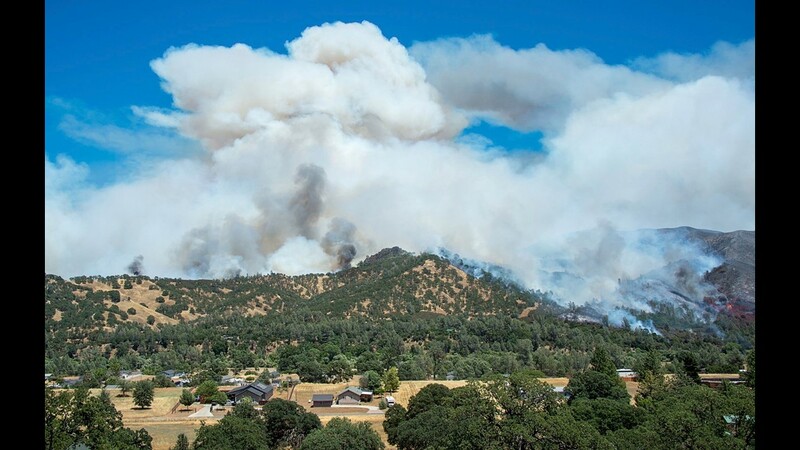 The Mendocino Complex fire is actually two fires – the River and Ranch Fires – that have grown together to create one gigantic fire. 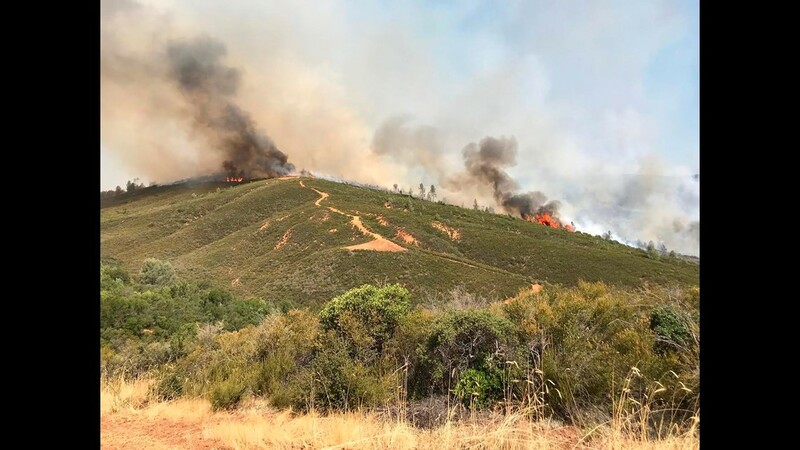 According to Cal Fire, the Ranch Fire continues to grow in the northern and southeastern directions, "threatening communities in the fire's path." 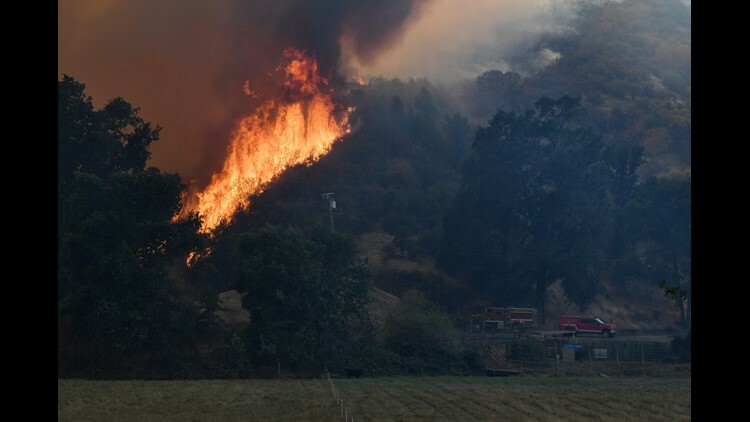 Mandatory evacuations are in place for areas in Lake, Colusa and Mendocino Counties. 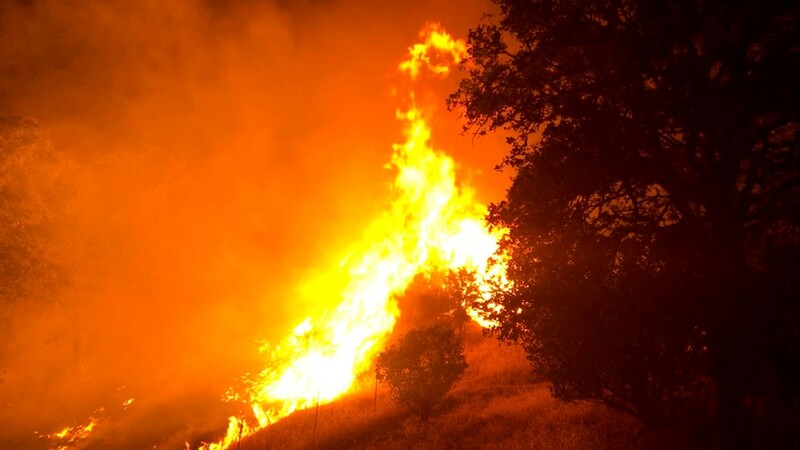 That fire joins the list of massive wildfires scorching California and the western USA. 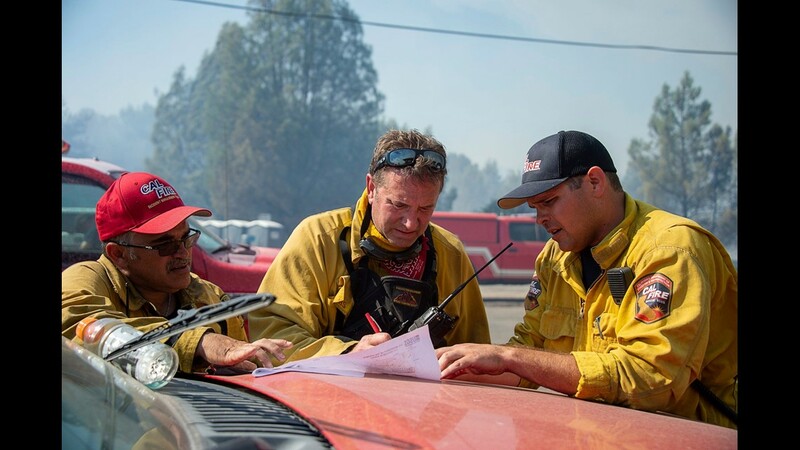 There are at least 18 fires burning in California and 100 fires burning in the USA, according to the National Interagency Fire Center, which said 28,000 firefighters are battling the fires across the nation. 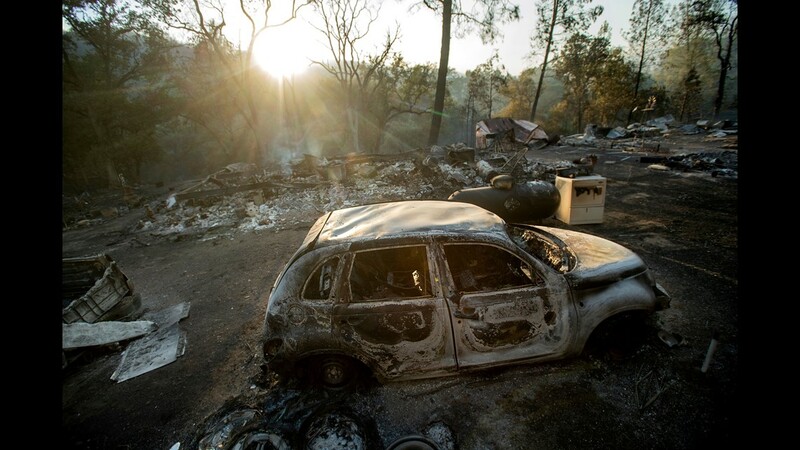 California's Carr Fire, which has killed seven people and destroyed more than 1,000 homes, is 43 percent contained, Cal Fire said. 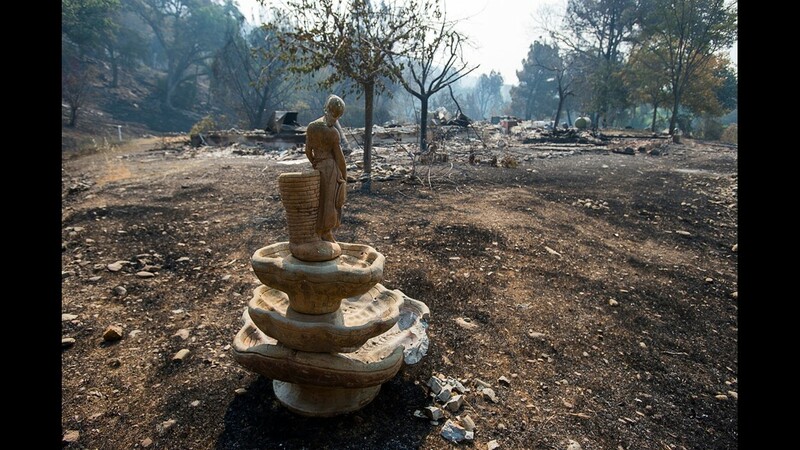 At 255 square miles burned, it's the 15th-largest and sixth-most-destructive fire in state history. The blaze has done about $98.3 million in damage to roads, bridges, utilities and other public facilities in Shasta County. 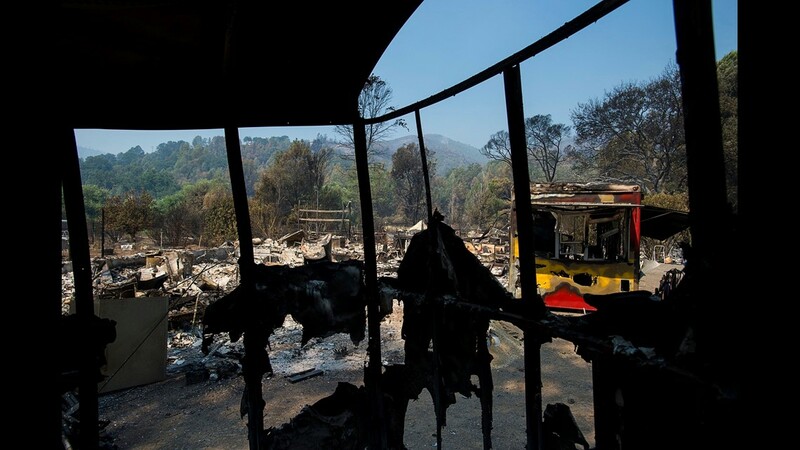 Saturday, the Trump administration declared Shasta County the scene of a major disaster. The presidential declaration opens the door to a variety of assistance programs for the community. 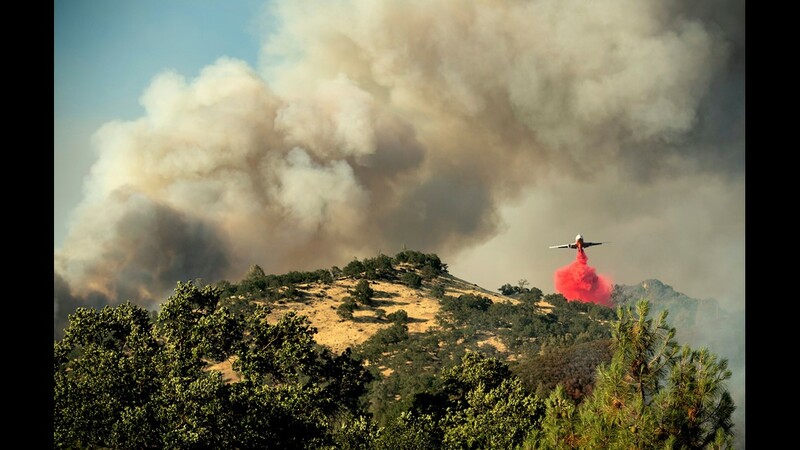 Another wildfire, known as the Ferguson Fire, had burned more than 140 square miles near Yosemite National Park as of Sunday. 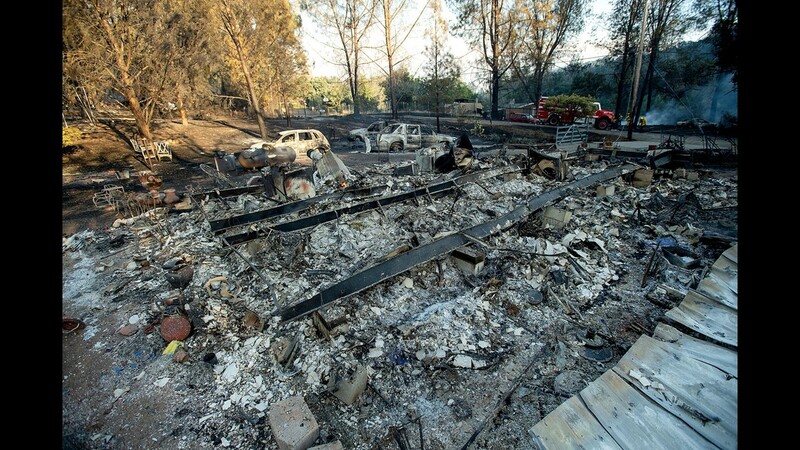 Two people have died in that fire, which is 38 percent contained, according to the Weather Channel. A portion of the national park, which has been closed since last week, is likely to remain closed indefinitely. The weather will offer no relief this week as high heat and low relative humidity will plague firefighters each afternoon and evening, AccuWeather said. High temperatures will remain above 100 degrees each day for much of California, except along the coast. 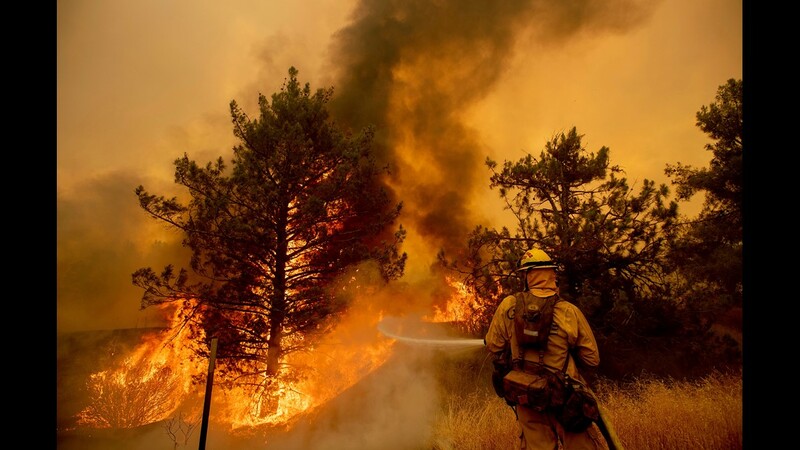 UCLA climate scientist Daniel Swain said about half of the increase in recent California wildfires can be blamed on the extreme warmth fueled by human-caused climate change. He said other factors include homes built in high-risk fire areas. "We've put a lot of people and a lot of stuff in harm's way," Swain said. 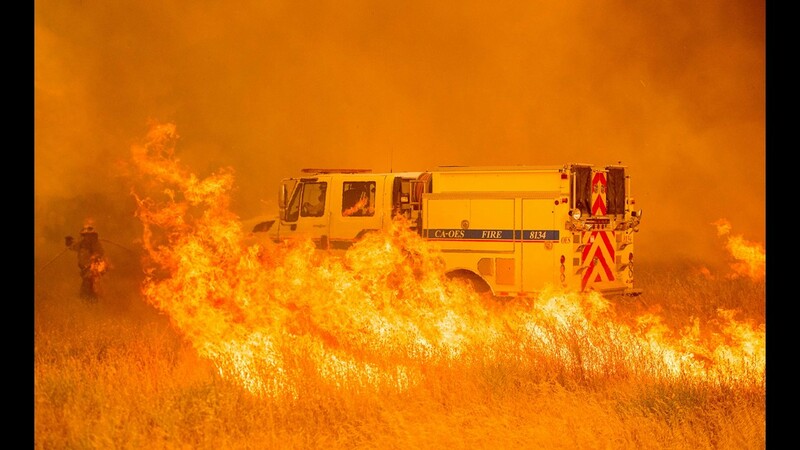 A fire vehicle is surrounded by flames as the Pawnee fire jumps across highway 20 near Clearlake Oaks, Calif. on July 1, 2018. 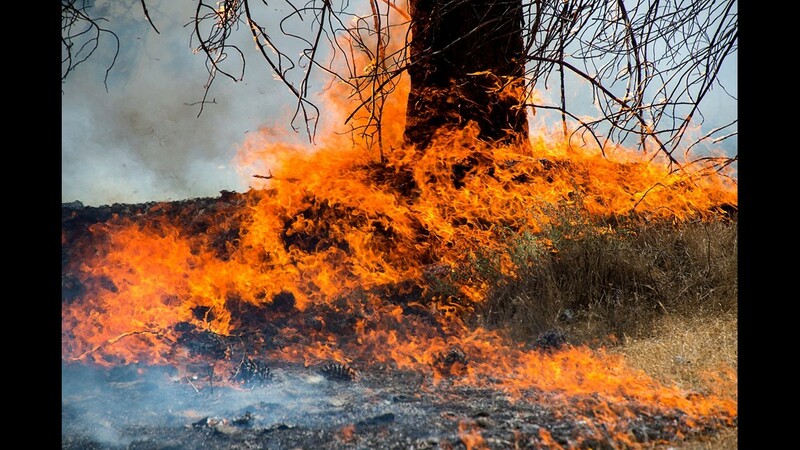 More than 30,000 acres have burned in multiple fires throughout the region. 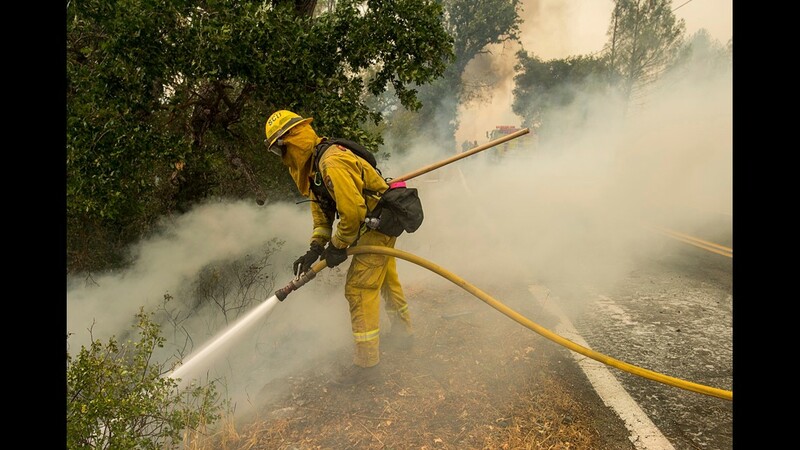 A firefighter scrambles to stop the Pawnee fire as it spots across Highway 20 near Clearlake Oaks, Calif., on July 1, 2018. Firefighters scramble to get control as flames from the Pawnee fire jump across highway 20 near Clearlake Oaks, Calif. on July 1, 2018. 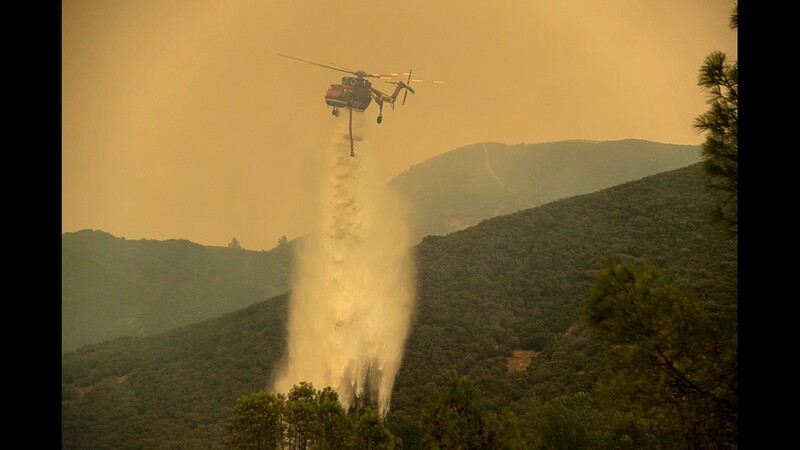 A water dropping helicopter works the scene as the Pawnee fire jumps across highway 20 near Clearlake Oaks, Calif. on July 1, 2018. A tree ignites as firefighters attempt to stop flames from the Pawnee fire from jumping across highway 20 near Clearlake Oaks, Calif. on July 1, 2018. 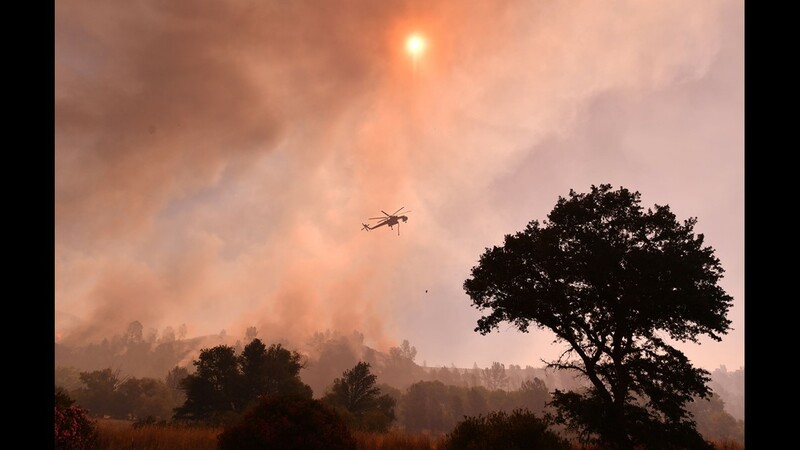 Fire crews battle the Pawnee Fire on Cache Creek Road on June 25, 2018, in Spring Valley, Calif. Thousands were forced to flee their homes as major wildfires encroached on an area of Northern California still recovering from severe blazes in recent years. 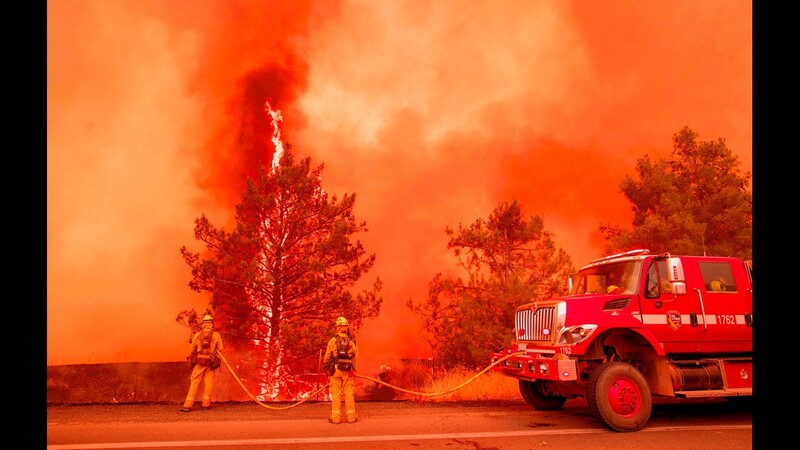 Fire crews battle the Pawnee Fire on Cache Creek Road in Spring Valley, Calif.
A tree burns in Lake County, Calif. The Pawnee Fire burns down the mountain near Spring Valley, Calif.
Homes on Wolf Creek Road in Spring Valley, Calif., were destroyed by the Pawnee Fire. 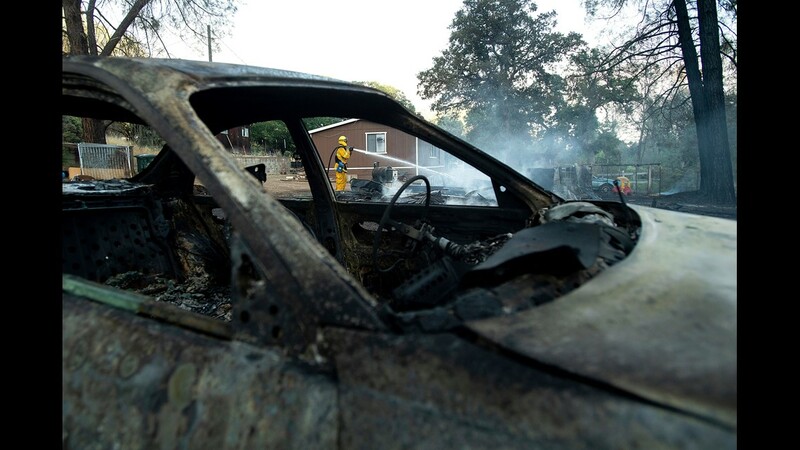 Vehicles and homes on Wolf Creek Road were destroyed by the Pawnee Fire in Spring Valley, Calif.
A vehicle scorched by a wildfire rests in a clearing on Wolf Creek Road near Clearlake Oaks, Calif., Sunday, June 24, 2018. 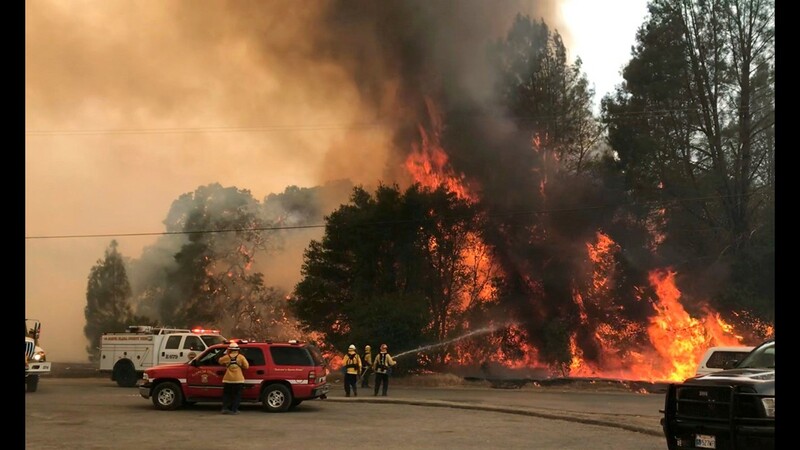 Wind-driven wildfires destroyed buildings and threatened hundreds of others Sunday as they raced across dry brush in rural Northern California. 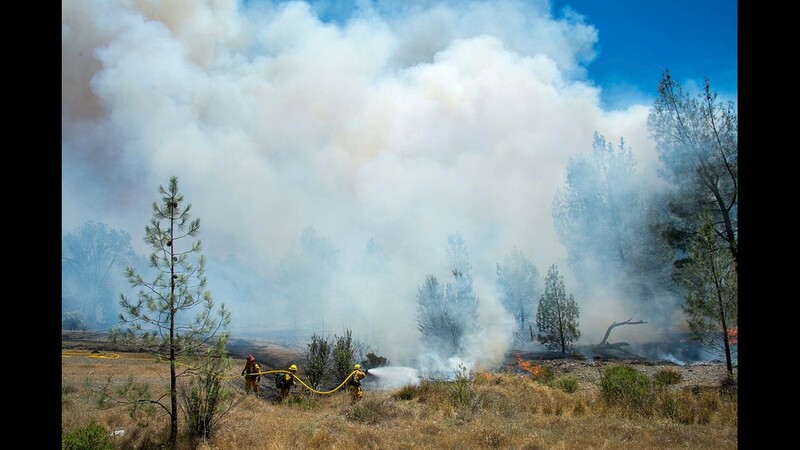 In this photo provided by the Cal Fire Communications, firefighters battle a wildfire in an area northeast of Clearlake Oaks, Calif., Sunday, June 24, 2018. 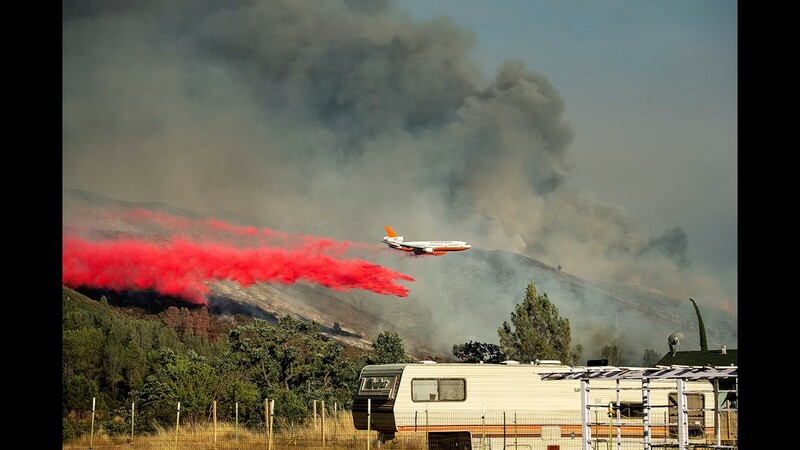 Firefighter Richard Cotter battles a wildfire on Sunday, June 24, 2018, near Clearlake Oaks, Calif.
An air tanker drops retardant on a wildfire above the Spring Lakes community on Sunday, June 24, 2018., near Clearlake Oaks, Calif.
A structure leveled by a wildfire rests in a clearing on Wolf Creek Road near Clearlake Oaks, Calif., on Sunday, June 24, 2018. 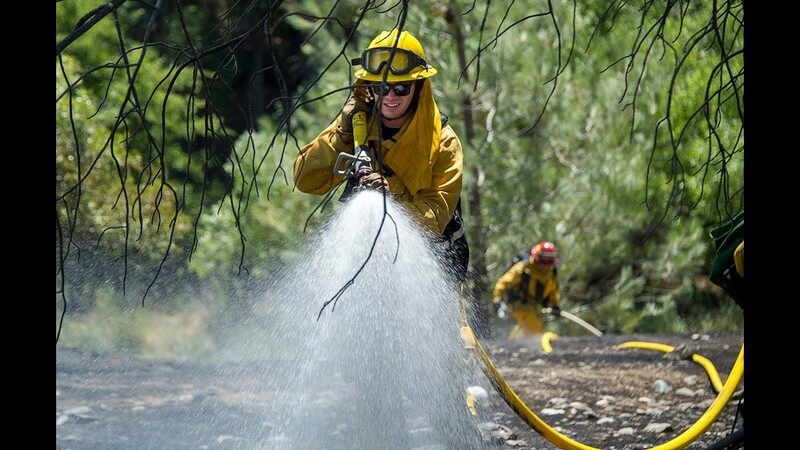 Firefighters work to contain a wildfire in Spring Valley, Calif. on June 24, 2018. 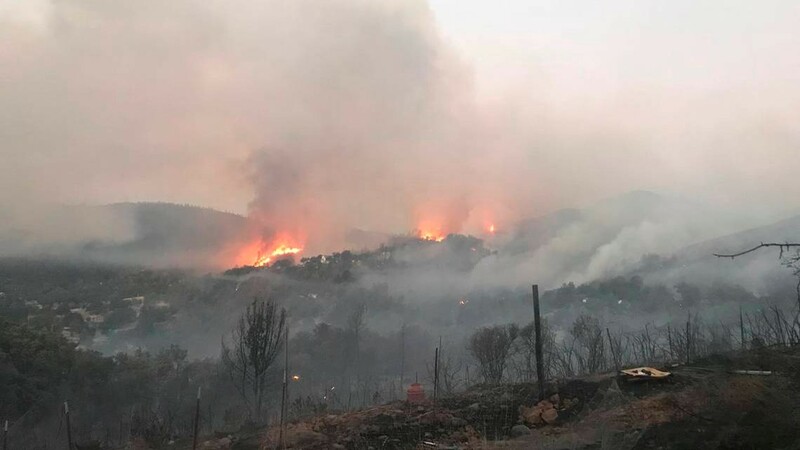 Wind-driven wildfires destroyed buildings and threatened hundreds of others as the fire raced across dry brush in rural Northern California. Kevin Clark helps to protect his brother's store as a wildfire burned and surrounded the area in Spring Valley, Calif.
Cal Fire battles a wildfire in Spring Valley, Calif.
A Cal Fire helicopter helps battle a wildfire in Spring Valley, Calif.
A Cal Fire incident management team discusses the plan to battle a wildfire in Spring Valley, Calif.
Horses roam in a pasture as Cal Fire battles a wildfire in Spring Valley, Calif.
An inmate crew battles a wildfire in Spring Valley, Calif. 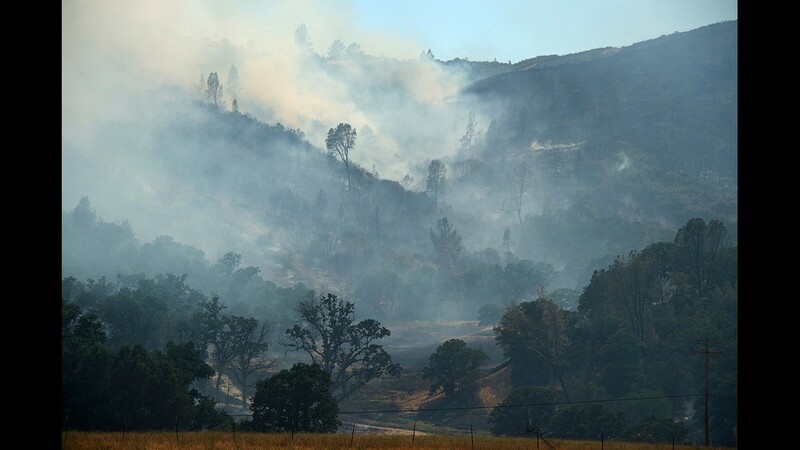 The Pawnee Fire wildfire burns northeast of Clearlake Oaks, Calif. 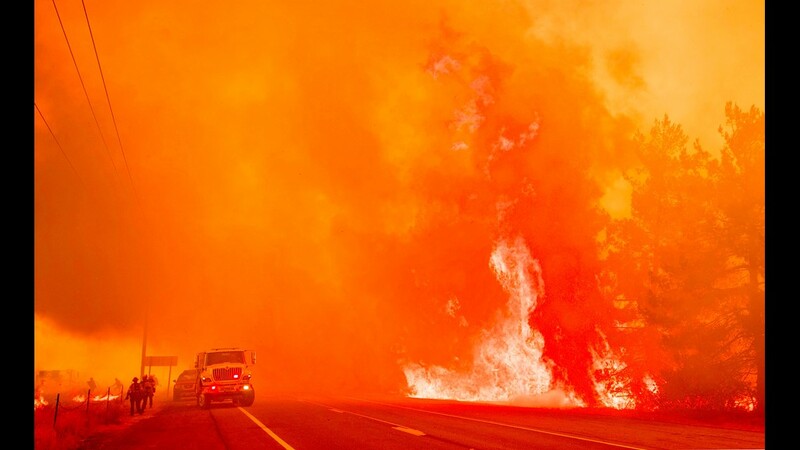 The Pawnee Fire wildfire burns in the Spring Valley area, northeast of Clearlake Oaks in Lake County, Calif. 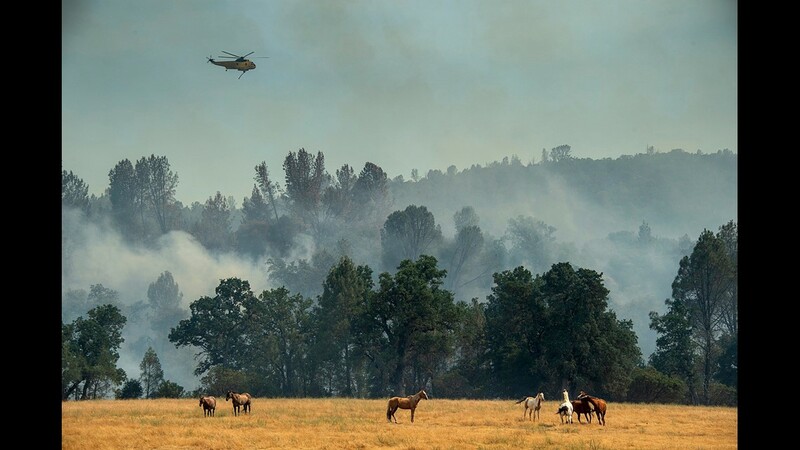 The Pawnee Fire broke out on June 23, 2018, near Clearlake Oaks, is one of four wildfires burning in largely rural areas as wind and heat gripped a swath of California from San Jose to the Oregon border.